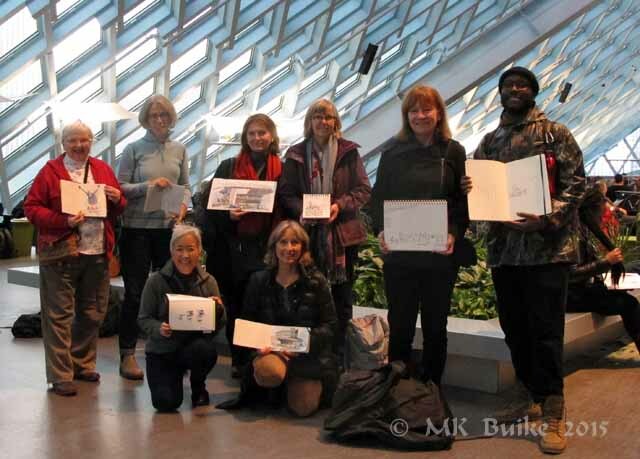 Urban Sketchers Seattle: Two for One! 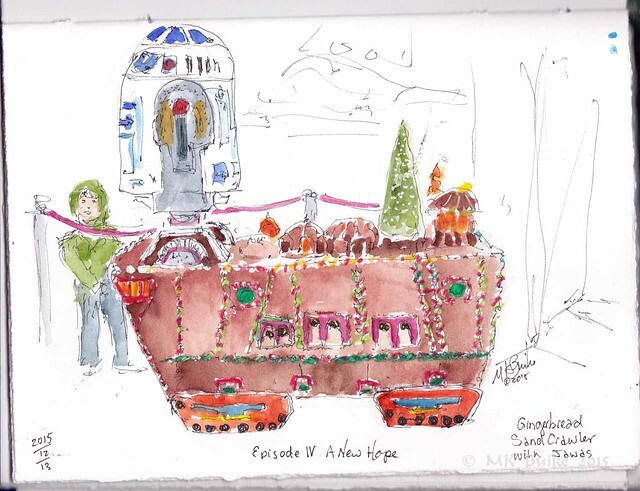 I thought I would be so efficient today, combining an early morning trip to see the Star Wars Gingerbread Village and the Noon time meeting for the Seattle Urban Sketchers' outing at the Central Library. Little did I know that the 5k Jinglebell run was happening in the area of the Sheraton hotel, host to the Gingerbread extravaganza. Just as I approached the hotel about 0815, the first runner crossed the finish line! I did get in ahead of them and got a full circle with lots of photos. All 6 of the villages were fantastic! It is such creativity and artistry in sugar spread out before us. Even a "Han in Carbonite" in sugar. And Yoda teaching the Jedi Younglings! 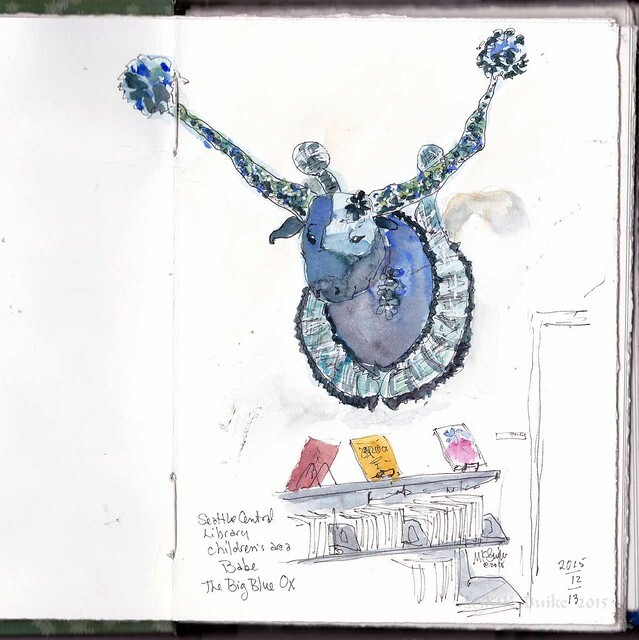 By the time I was ready to set up for sketching, the hordes of runners were beginning to enter. I stood outside the ropes and sketched as best I could while the throngs walked by. My first choice was the Gingerbread sand crawler with Jawas as I have a friend who is partial to Jawas. I'd hoped to do more, but it became just too crowded. By then it was 1000 and I still had 2 hours before the meeting time for the sketch outing. 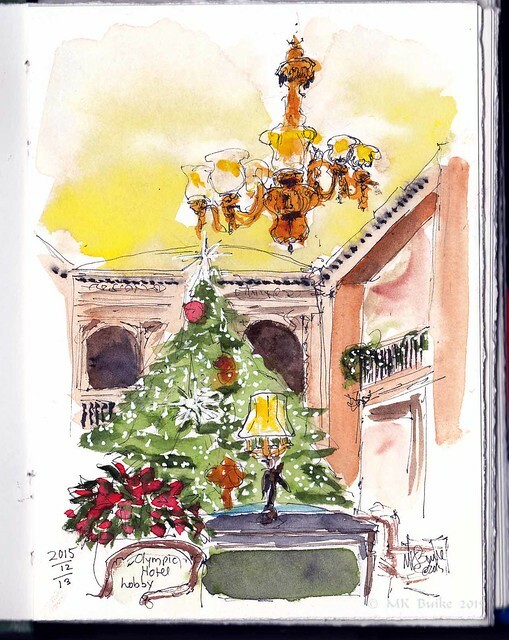 I thought the 3 story lobby of the Fairmont Olympic hotel would be a calm place to wait, not to mention beautifully decorated for Christmas. I sketched more of the lobby than I have attempted in the past. 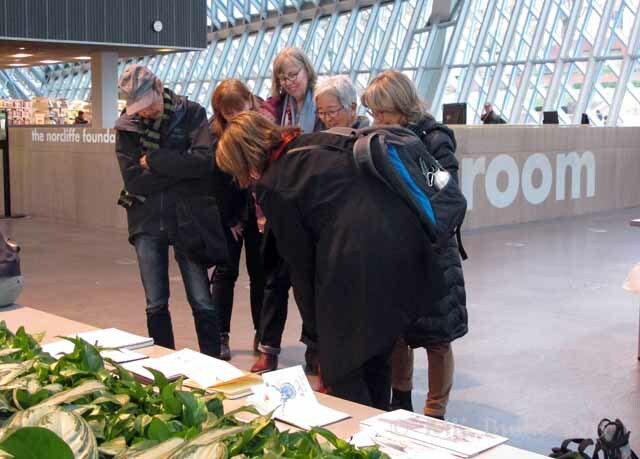 Then it was finally time to get on to the Library to meet the group. I've sketched there a few times before, so I thought I'd try something new. 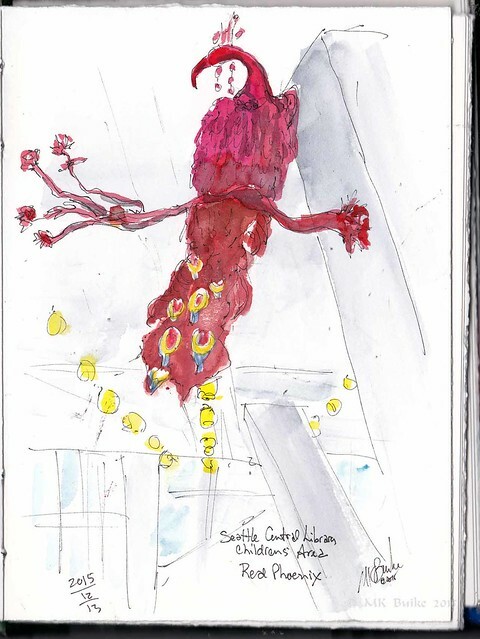 I went to the children's' area and sketched the interesting sculptures hanging from the walls. The first is Paul Bunyan's companion, Babe, the Big Blue Ox. There are massive statues of both in the northern part of Michigan, my home state. Of course, there are many others spread across the USA. Next was this flamboyant red bird. It looks part phoenix and part peacock. We met up just a bit early, at 1400. As far as I know, only Frank Ching is missing from the group photo. But he made it into the sharing sketches photo. Nice drawings Kate, I really like the Fairmont Lobby drawing. Sorry I was out of town and missed the sketch outing. Looks like I missed a lots of funs...just by your amazing sketchers. Thanks, Kate.